Falling out of love? Is divorce worth it? Avoid divorce with a marriage retreat. Falling out of love? 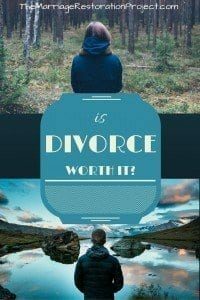 Is divorce worth it? Avoid divorce with a marriage retreat. Is divorce worth it? Falling out of love? Avoid divorce with a marriage retreat. Is divorce worth it? Let’s think about the pros and cons of divorcing your spouse, and any alternatives that you should consider (like marriage counseling or even a couples retreat for therapy) before taking the leap. Should you get a divorce? Take this quiz and find out. The quickest way to reawaken love. The Getting the Love you Want retreat is magical. On the one hand, you might think you’ll able to leave behind a painful relationship, and get to start anew. Perhaps you’ll even find someone better. On the other hand, you’ll have to pay alimony, have less money, share custody of the kids, and start dating again. This is not to mention dealing with your ex if you have kids, which may be even more difficult than when you were married. Divorce is not the best long term solution. While divorce may seem the best way to relieve the immediate pain, it’s usually not the best long-term solution. Sometimes women look forward to the freedom that they think divorce is going to give them-not having to care for a husband – but they often wind up feeling lonely, especially if their ex remarries quickly. Husbands often feel they’ll be rid of what feels to them like their wife’s emotional outbursts but they soon discover that it’s not easy being alone. That’s why it’s worth trying to save your relationship. If you’re successful, you’ll not only avoid all of the downsides of divorce, you’ll enjoy all the positive of a happy, loving relationship. If you don’t succeed, at least you gave it a chance. Whether or not you ultimately decide to get a divorce, you’ll always be connected to your spouse if you have children, so it behooves you to learn how to communicate with your spouse. Even if a professional or friend is advising you to divorce for these top divorce reasons, we still have hope for you. We’ve seen even the most difficult couples succeed at saving their relationship and avoiding divorce in our 2 day private marriage intensive retreat. Contact us now if you would like to schedule your own private marriage retreat to avoid divorce and prevent falling out of love.